On 27th November 2018, Worcester College, Oxford ran their first ever Giving Day, raising an impressive £70,000 from a record 126 donors. 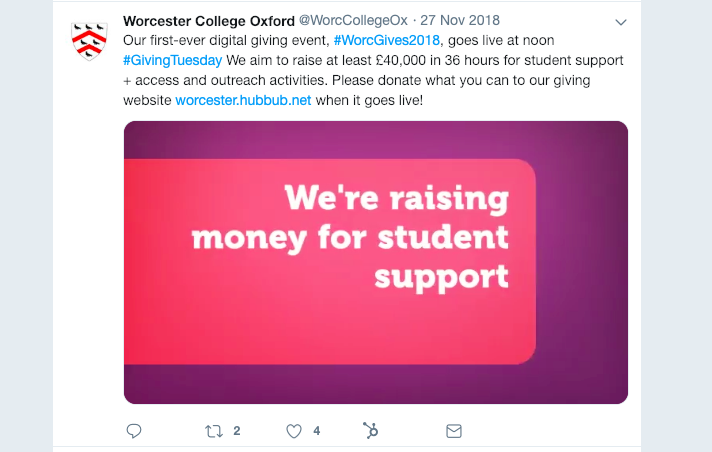 Kat Carter, Hubbub’s Digital Fundraising Specialist, talks about how teamwork between the Worcester College team created such a successful outcome. At the end of November 2018, I was pleased to join the team at Worcester College, Oxford for their first ever Giving Day. In preparation for the day, the team had been busy gathering match and challenge gifts, recruiting ambassadors, designing a fabulous Giving Day site, and creating engaging content for their communications. They hoped their hard work would encourage members to take part like never before. I’d joined them periodically throughout the build-up, sharing the handful of Giving Day examples from the UK, as well as learnings from peers in the US. Together, we’d planned, we’d prepared, we were ready, and we were quietly confident that the 36 hours ahead of us would be a success. No one individual can run a Giving Day alone. It takes a team of people with different strengths, so we all had our roles to play. What made the Worcester Giving Day such as success were the skills that each member of the team brought to the table. was Coleen Day, the College’s Director of Development and Alumni Relations was leading the team. She’s built relationships with members of the College’s alumni community over many years, so she was able to build relationships with major donors so they agreed to contribute match and challenge donations. This was critical to the Giving Day’s success, because it generated excitement and enthusiasm among alumni, students and staff. By encouraging them to participate, it created a steady flow of donations and ambassador engagement. Anna Fowler, the College’s Executive Officer, and Maria Coyle, the team’s Media and Communications Officer, developed a highly engaging, data and segment-driven communications plan. Anna also attended a digital fundraising workshop, which gave the team the confidence to create relevant videos and social media content. This enabled them to send meaningful, targeted messages to alumni and donors throughout the day. With fun content that told a continuous story, they kept interest and engagement high on social media that converted into donor participation. Together, the team created a synergy that enabled each area of the Giving Day to flourish and benefit. Match and challenge gifts inspired alumni to get involved by making their own gifts. Ambassadors shared social media messages, triggering referral donations and further shares to spread the College’s message wider. All combining to make the day a smooth success. The success of a Giving Day, more than any other engagement activity, relies on an exceptional team, working together. The stakes are high. They need a lot of planning, process and hustle to make them happen. They’re very public, which makes them a little scary. And they can be a huge risk if you don’t approach them in the right way. The Worcester Giving Day team was made up of people who recognised each other’s strengths, and trusted each other’s abilities and know-how. By working together towards a common goal, approaching it with an open mind, having clear priorities, and planning effectively, we made the whole process a pleasure rather than a chore. We recently asked the team at Worcester to reflect on their giving day success - read their case study here.